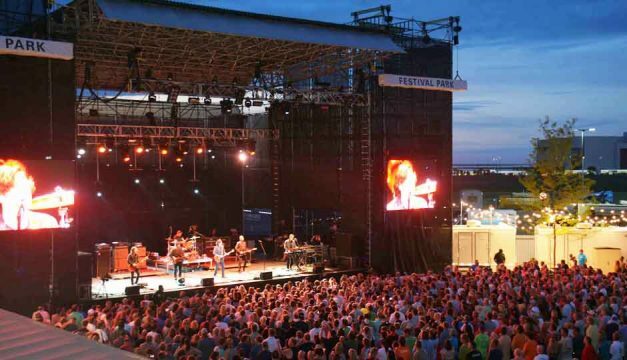 This summer, Borgata Hotel Casino & Spa upped its offerings with Borgata Festival Park Outdoor Concert Grounds (yep, it’s as good as it sounds). Known for its extensive casino action and relaxing spa packages, the Atlantic City hotel makes its mark on the music scene with Festival Park. The scoop: since opening in June, the concert venue has played host to some of the hottest names in music (think 311 and The Killers), and crowds filled the lawn to belt the lyrics to their favorite songs. The stacked lineup continues through September with hit acts from the country, rock and pop genres. “In booking such tremendous artists to perform in a fun, energetic, outdoor space, this new concert venue and festival grounds effectively adds yet another dimension to what we can offer our guests,” says Joe Lupo, Senior Vice President of Operations for Borgata Hotel Casino & Spa. The outdoor space holds 4,500 people at capacity. The area is spacious without being overwhelmingly so and provides music fans an opportunity to feel closer to performers than in a larger stadium or arena. Lounge areas, umbrella-topped tables and bars encircle the lawn, encouraging guests to relax and take in the Festival Park experience (ahem, no tent required). Once you snag tickets to one of the concerts listed above and reserve your room, fill your itinerary with other Borgata specialties. You’ll find renowned DJs and bottle service at nightlife spots MIXX and mur.mur. Meanwhile, Spa Toccare offers 54,000 square feet of relaxation, and Immersion Spa, located on the 32nd floor of The Water Club, provides 360-degree, floor-to-ceiling water views. Borgata is also known as Atlantic City’s premier LGBT destination. OUT at Borgata offers hotel packages, entertainment and special events designed specifically for LGBT travelers. Indulge in a “vinotherapy” spa treatment with the Winecation Package, or enjoy dinner, drinks and a comedy show with the Up All Night Package. For more information on these packages and other LGBT events and accommodations at Borgata Hotel Casino & Spa, click here. To learn more about summer shows, concerts, and events at Festival Park and to purchase your tickets, click here.